The jaw-dropper of this draft for the Birds, Kolb (pronounced Cobb) wound up as the lone Houston player drafted . . . Finished his career as one of the most prolific passers in NCAA history, accumulating 12,964 passing yards, 13,715 yards total offense and 106 TDs . . . 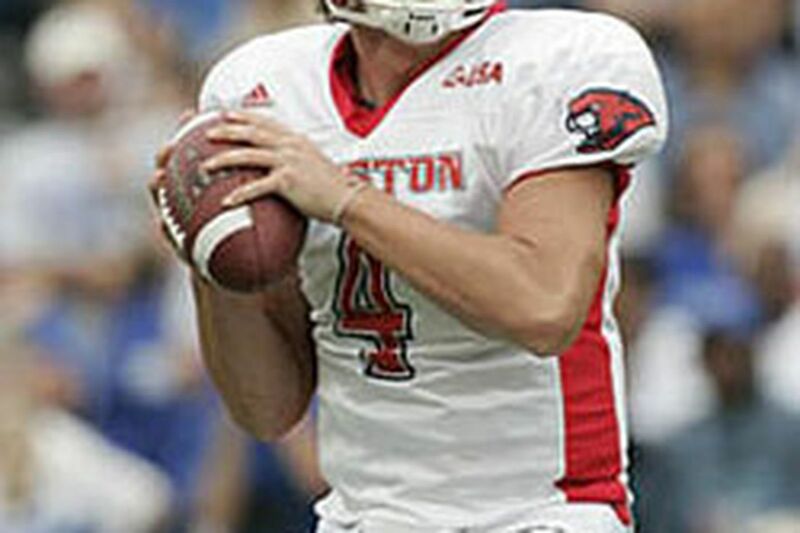 Led Cougars to a 10-win season and their first Conference USA title since 1996 . . . A standout quarterback at Stephensville (Texas) High School, he became the first true freshman in Houston history to start a season opener at quarterback, then started all four seasons . . . Finished 2006 with career highs in passing yards (3,809), touchdowns (30) and completion percentage (.676) as well as a career low in interceptions (four), making him finalist for Johnny Unitas Golden Arm Award . . . Was tutored during draft season by NFL quarterbacks coach Jerry Rhome, who was responsible for 14 NFL quarterbacks reaching the Pro Bowl . . . Scouts like his leadership, his ability to hold on to the ball under pressure (33 sacks, 1 fumble in 2006), and his accuracy . . . Some question his habit of looking at his No. 1 target too long and his lack of the classic arm strength that made JaMarcus Russell so appealing. The eighth defensive end picked in this draft, Abiamiri started every game as a junior and senior . . . Led Irish in sacks (10 1/2) and quarterback hurries (14), and was second in tackles for a loss (15 for 88 yards) as a senior . . . Two of his career stats - 21 1/2 sacks and 40 tackles for loss - rank him among the top four all-time at Notre Dame, although he seemed destined to break the sack record after getting eight in a four-game stretch this past season . . . Named team's best lineman his junior and senior years after being no more than a situational pass rusher his first two seasons . . . Grew up in Baltimore and starred at The Gilman School . . . One of three children, his two brothers (Rob and Paschal) played college ball at Maryland . . . Rob plays tight end for the Ravens . . . Great agility and quickness, but observers suggest he'll need to add some pounds and strength to what has always been a lean frame . . . Some say he'll need to develop more moves and improve his hands to get rid of blockers . . . Said coach Charlie Weis of Abiamiri: "There are a lot of people with athletic ability that don't have a high motor, [but] he goes high on every play." Progressed from a walk-on at Nebraska to a 3-year starter at strongside linebacker . . . Played in 43 games (started 29) and finished with 175 career tackles, four sacks and 25 tackles for losses despite missing half his junior year with a knee injury . . . Showed well at the Senior Bowl and NFL Combine . . . NFL.com suggests he could add another 20 pounds without reducing his quickness . . . Not everyone has been impressed: SI.com identified Bradley as the most overrated linebacker in the draft . . . Still, NFL.com analyst Gil Brandt sees Stewart differently despite a 4.71 in the 40: "I'll show you some fast guys who don't play well and slow guys who play pretty well. The guy's a competitive player, and that's the main ingredient" . . . Injured through much of high school, he couldn't get any of the colleges near his home (BYU, Utah and Utah State) to show interest . . . Was better known as a starting wing on his high school's rugby team that won three straight national titles . . .
Well, there should be no more complaints about the Birds lacking a power runner to complement Brian Westbrook . . . Hunt is only the fifth player in Penn State history to rush for more than 3,000 career yards and the sixth to rush for more than 1,000 yards in more than one season (1,047 in 2005 and 1,386 in 2006) . . . Finished with 14 total TDs as a senior . . . Observers like his ability to move the chains and work the ball between the tackles, and his skills as a blocker . . . Before the draft, one pundit called him "the best big back in the draft in terms of size, power and ability to carry the load (25 to 30 carries per game) on a consistent basis." . . . No one expects him to run away from any tacklers. The first Eagle to be drafted out of Clemson since Brian Dawkins in 1996, but no one's about to suggest there are many similarities beyond that . . . Came out of high school in North Carolina as a quarterback . . . Played a number of positions for the Tigers, including cornerback, nickel back, strong safety and strongside linebacker . . . Numbers (27 tackles, two interceptions) his senior year were curtailed by an academic suspension and foot sprain . . . Stayed busy in the weight room, and developed into one of team's strongest players . . . Seattle Mariners liked him enough in 2003 to draft him with their 20th pick. Looks like a guy who will get the Birds catches, but not many yards after the catch . . . Saved his best numbers for his senior year (38 catches, 481 yards, 3 TDs) after adding 15 pounds to his frame . . . Scouts liked his ability to work the middle of the field and hold on to the ball, but he gets lower marks for his agility and speed . . . Will recognize former college teammate Trent Cole when he gets to training camp . . . Oldest of five kids, he grew up in Cincinnati . . . Was a standout in football and throwing the shot put in high school. Maybe he's the 5-hole hitter the Phils have been trying to identify . . . Played baseball for two seasons at Hudson Valley Community College in New York, where he was an outfielder, before transferring to football at Albany as a walk-on . . . Earned several honors during his only season at Albany, finishing with 39 tackles and three interceptions for the 7-4 Great Danes . . . Also averaged 8.5 yards per punt return. Most intriguing of the nonquarterback picks . . . Nicknamed "Nasti," his last name is pronounced ee-LAW-wuh . . . Because of injuries, etc., spent six seasons at Hawaii, where he bulked up 75 pounds . . . Career stats include 222 rushes for 1,689 yards (7.6 avg.) and 20 touchdowns, and 151 catches for 1,694 yards (11.2 avg.) and nine scores . . . Was a record-setting receiver in high school in Virginia, then played a lot as a single setback in the June Jones' Run and Shoot at Hawaii.